Explanation: Something very bright suddenly lit up the arctic -- what was it? The original idea was to take a series of aurora images that could be made into a time-lapse video. But when night suddenly turned into day, the astrophotographer quickly realized that he was seeing something even more spectacular. 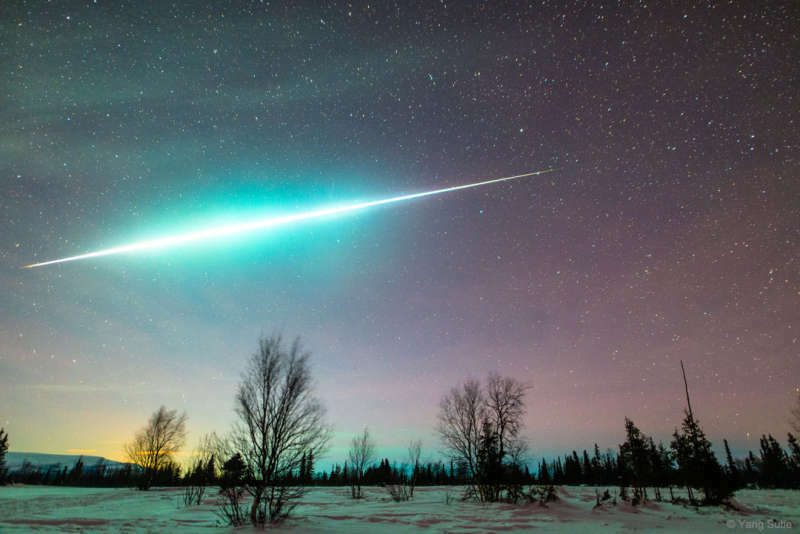 Moving through the sky -- in front of the Big Dipper no less -- was a Geminid meteor so bright it could be called a fireball. The meteor brightened and flashed for several seconds as it went. By a stroke of good fortune, the aurora camera was able to capture the whole track. Taken the night after the Geminids Meteor Shower peaked, the astrophotographer's location was near Lovozero Lake in Murmansk, Russia, just north of the Arctic Circle.